If you've been reading since the very beginning, you'll recall I did something very similar when we first moved to California. I'm doing it again (albeit after a few months of being in PA), since it seems to help paint a mental picture. Yardley is not as large as Mountain View, and the line between other cities is often blurred. The areas are also smaller. Within twenty minutes, we could easily be in ten or so different cities, including Fairless Hills, Newtown, Langhorne, Morrisville, Feasterville, Richboro, Levittown, Tullytown, and Bristol. Oh, and this isn't counting the fact that we can be in New Jersey in about ten minutes. 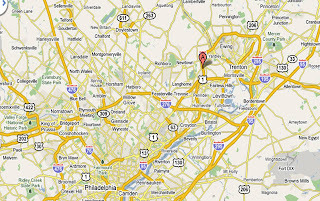 Trenton is like, right there. 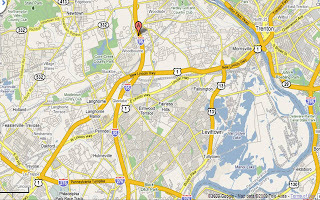 Here's a couple of maps (one more zoomed in), you can see we're verrrry close to I-95 (we live at 'A'). There's a BJ's and a Sam's about ten minutes away (they're just about a half mile apart), but our memberships with both have expired, so we spent some time walking around each store, trying to decide which we should belong to. In the end, we decided that 30 minutes isn't that far, and since we prefer Costco, we'll just drive to Mount Laurel, NJ to buy bulk items there. We've done it a few times so far, and the drive's not bad, there's no tolls, and better quality, so we'll just stick with that. - McCaffrey's is a new, nicer store, and the produce is priced similarly to Giant. Their dry goods seem to run about a dime more, and Giant also seems to have more sales (and does double coupons all the time). McCaffrey's does have a salad bar, a sub station, and hot soups and Asian food, which Giant cannot boast. The subs are actually quite good. They also do samples of yummy things like hummus and pizza. - Giant has some quality store-brand stuff, and carries most name-brands that we enjoy. They have Boars Head in their deli, and the set-up of the store is fairly basic, although they put breads across the aisle from refrigerated, so that's strange. They also have a kiosk to order your deli meat if you don't want to wait in line. You just punch in what you want, come back in fifteen minutes, andit's waiting for you on a little shelf. - Acme did not impress me. The store is very large, and the set-up is awkward. It's also at a horrendous, triangular corner with only one entrance/exit. If you miss the turn going one way, you have to go past the highway and over the bridge before you can turn around (and the day I visited there was an accident on the bridge, so I got routed onto the highway going North, with just one exit left before I hit NJ). So, Acme will not be revisited. - SuperFresh is a good store (and only a scoash farther than Giant and McCaffrey's). It's in a strip mall with Blockbuster, Hallmark, and Hair Cuttery, among other stores. They have a very large produce section, and they often run 10/$10 sales. They also have fresh soft pretzels for 50 cents, which we take advantage of nearly every time we go there. I really like the way they're set-up, and I believe it'll be a staple with Giant for our needs. - Pathmark is an older store, and in a strange area of town (not a bad area, just an area where there isn't much else of use - aside from a ski shop and a Big Lots). It is pretty big, and decently easy to navigate. They run great sales (when I visited you could get five 12-packs of Pepsi products for just $1 each if you also purchased a $6.99 package of chips/doritos/other school-size snacks)... but it seems the other major stores run the same sales a week later... so no need to go back there. - ShopRite seems to be much seedier than I remember as a child. The sales aren't that great, and they don't take double-coupons all the time. AND, they're kinda far away. no. - Genuardi's seems is very similar to Safeway, as in owned by them. Still only about five minutes away, but in a direction we don't need often. Organized like Safeway, so it's hard to find what you need, LoL. And their sales aren't ideally timed (they often run F-S-S only), so they are also a no-go. Remaining issues from all of these stores: I want to find where I can get delicious-yet-inexpensive baked goods! I've even tried a few straight-up bakeries to no avail. :( We're also having issues finding cheap meat. Chicken is everywhere, and pork goes on sale. But we can't get good hamburger to save our lives. There's gotta be a secret stash of it somewhere around here... there are three or four meat markets around, so I might have to try those out soon. We've been to two local malls - Oxford Valley about ten minutes away, and Franklin Mills in Philadelphia (but verrry north Philly, almost Bensalem). Both have their ups and downs, but overall I'm very happy they're around. There's also the Neshaminy mall just two exits down, but I haven't been there yet. Target and Kmart are within 15 minutes, but WalMart and Ross are a good twenty minutes away... not that big of a deal, since I'd given up on WalMart when we lived in Cali in favor of Target. BUT, I love going to Ross on the fly, and that won't be happening since it's in a direction toward nothing else. Our Dollar Trees are amazing. Much more variety and higher-quality than in Florida. The holiday stuff is crazy cheap, I've been picking up a few things left and right, for decor and the like. Our apartment is only two or three miles from Jonathan's work. We're no longer super-close to a train station, but we have heard a few tricks (like parking at the Princeton station is a lot cheaper than at the Trenton station) for taking the train. We'll definitely give it a go for NYC, and perhaps even Boston. Plus, after getting schooled in parking in Philly, we'll probably take it there, too. General driving.... it's really a strange concept to be so close to a state line. Now, I lived in Tallahassee for six years, and that's only about 20 minutes from the Georgia line, but I think I only drove into Georgia once, since there wasn't a major city or anything where we crossed. Traffic around here isn't bad (although we are near an interchange for I-95 and one for Route 1), but driving in and out of Philadelphia is a hit-or-miss situation. It seems to depend more on construction than anything else (since time of day and day of week trends don't add up).